SUMMARY: So much history of dogs coming and going in just a small date range. The Boy Beasties stayed home without me for 10 full days. I'm sad that I didn't miss them much at all. Almost the only times I thought about them were when my sister wondered how her dog was doing at home during the same time, and also at night when I'd be dozing off and switch positions and my foot would bump something and I'd apologize to the dog--which wasn't a dog, it was a pillow or bunched-up blanket. 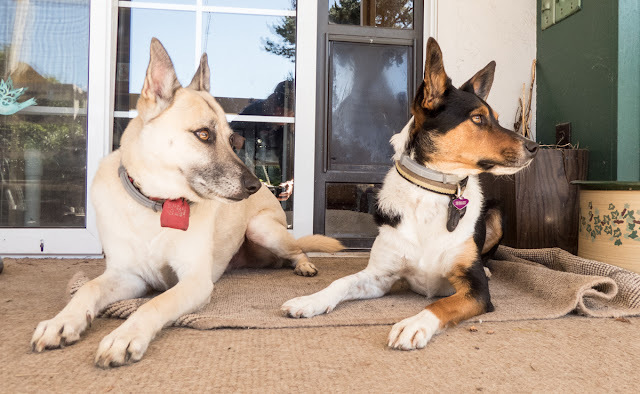 I've always liked vacations away from my dogs, frankly--they are so limiting unless I'm specifically planning a dog getaway, in which case my activities are predetermined and dog-focused. But usually I miss them a *little*, anyway. Got home very late last night. Dogs--well, Zorro in particular--didn't want to settle down even though I was exhausted and in pain, and frustration reigned and grew and grew until there I was in the middle of the night physically throwing him off the bed and yelling at him.Repeatedly. Because I was too tired to want to get up out of bed and put him into his crate. Not among my prouder or happier moments. But it did make me think that, after all these years of me and the dogs working things out to our mutual satisfaction on the bed-- 7 dogs in all -- it's time to move them into their own nighttime spaces. I have to figure out what and where; really room for only one crate in my bedroom. Not sure whether I have the wherewith all to teach them to stay in beds of their own without crates. Sigh. Another training challenge in response to a relationship problem or two. This is only my second time at Walt Disney World; the first time was just under 2 years ago when my same seester and husband took me after the Merle Girls died. To me, his "gotcha day" will always be May 11 because that's when I seriously started the process, and I will always tie his arrival to Boost's death because it was so close after she left that I first saw him and tried to resist. 2 years later, still so very many mixed feelings about both my wonderful, gorgeous Boy Beasties. So smart, so full of potential, so underappreciated. Guilt and grief and joy all intermingled. Compounded by confounded me who found that neither dog could remember how to sit or down on command after 10 days. Let alone stay there while sitting or downing. Let alone getting them to look at me. Weird emotional stuff. Doesn't mean that I didn't enjoy snuggling and rubbing tummies this morning. Owning a dog is such a big responsibility. While a dog's intelligence makes training seem easy enough, it can be quite tedious. Hard to tell true feelings when everything is tied together and jumbled up. But one true thing is sometimes we all get worn out. Truth be told I didn't miss Katie while we were in DC for 10 days. I felt guilty about that too. We're like parents, indeed, aren't we. Other things to do besides be with the kids. Feeling guilty when we're not with the kids or giving them the attention they want. I never intended to be this way. Yeah, I am worn out in a lot of ways, but I wouldn't feel nearly as badly if I spent more time with them when I *am* here. You and Katie at least do a walk pretty much every day, near as I can tell.